The year was 1920. It was the start of the decade, shortly after World War One, and a time of great prosperity for the country. Women were called dames, dolls, or the cat's meow. At the beginning of the decade, women still wore long skirts but the "Roaring 20s" brought a new look of short skirts and smartly coiffed shorter hair. Racial tensions were high and quotas set for immigrants coming into America. The Klan was very active during this period. The Harlem Renaissance was acknowledged as the first important movement of black artists and writers in the US. Sorors let us not forget that simple belief was back then...sorority elitism and socializing should not overshadow the real mission for progressive organizations...to address societal mores, ills, prejudices, poverty, and health concerns of this day and age. Happy Founders Day...sorors let's get back to the basics. 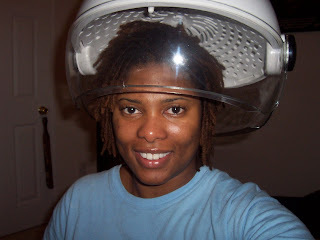 My hubby bought me this new hair dryer for Christmas. It isn't that Purple People Heater that I wanted but it works really well. It cuts my drying time in half, which is a plus for me. It is especially great when I have to wash my hair multiple times during the week due to my streneuous workout schedule (I am hitting the gym twice a day. Once on my lunch and right after work) and my hair is a sweating mess. So this dryer is my new best friend. Gotta love the hubby for paying attention when I talk. All I did was say...You know it would be great if I could sit at the computer while my hair is drying. He listened and went to Sallys and bought this dryer for me.